Expect a Miracle: Merry Christmas!!!! Merry Christmas everyone!! I just thougt I'd send out a Christmas greeting because my Christmas cards are not going to get done! Instead I'll be sending out a card after we finalize Ellie's adoption and are sealed to her this spring. We are doing well and have been so blessed this past year with our sweet baby girl. We love her to pieces!! What cute santa's you have...where did you ever find such a tiny little santa hat for Ellie? It's so exciting that you will be sealed this coming Spring! That is a good lookin' Santa!!! You guys are so cute. I love getting little updates. She is growing like a weed. 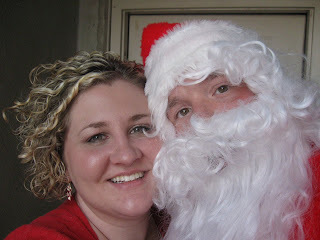 love the pictures--love ellie and love your santa man!!! So I guess Ellie did get a Christmas outfit, and that Santa looks rather familiar... How fun! Maybe Santa needs to come visit the Davis House, too!! she is so darling! we hope to see you soon! So cute! Little Ellie is adorable! 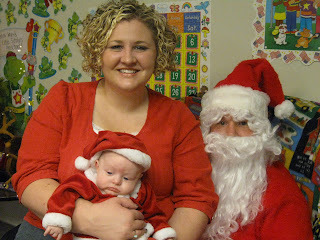 The holidays are going to be such a good and memorable time for your cute little family. Spring will be here before you know it...the sealing day will be so special. I hope you guys have a very Merry Christmas! Yes...santa is a stud. I can't wait to see baby ellie at the family christmas partys\. love you guys. Where ever did you find that darling Christmas outfit??? HE-HE!! 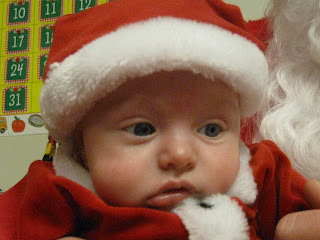 She is the most adorable Christmas baby ever!! Happy Christmas Eve! We love you guys to pieces!! Santa does look rather familiar...hummmm!! I just found your blog off of Carrie Petersons. 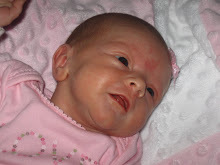 You have an amazing story and a beautiful tiny baby girl! Congrats on the new addition to your family! Awww!! Just tell people that this post IS you Christmas card! SO cute! Does Mrs. Claus know about you two? I just heard some good news about Sara, tell her congrats for me. I keep meaning to thank you for the wonderful comments you left on my blog, they have helped me a ton. You are so sweet for being so willing to share all that, I am sure it has been a hard experience but has turned out to be very beautiful! We are hoping for the same! Thanks for stopping by our blog and commenting. I can't believe how grown up you are! I remember babysitting you when you were just 3 years old! I love your family and am so happy for your little miracle! 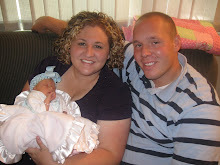 this is Jenny (McLane) Monson and Karen told me about your blog that I had to see. Your daughter is beautiful! I'm so happy you have the opportunity to be a mom. It's awesome uh!?! You can check out my blog at monsonsmania.blogspot.com and see how ancient I am. You were only around 5 when I babysat you. CRAZY!